The Armenian toast is not just about the drink, but about the words leading up to it. A visitor to Armenia can learn a lot by sitting at a dinner table and listening to toasts. They are an art form here. Some are short and sweet. Others are so long they leave guests wondering what the subject of the toast was. All, though, have meaning. And there is an order to how they are given, whether to the host, to the guests, to the motherland, to ancestors . . .
As an art, it is natural then that some have become masters in the art of toast making. Each table appoints a "tamada", the toast master, whose responsibility is to administer toasts. It is also proper for anyone who wishes to make a toast to first get permission from the tamada. Samvel Muradyan, 41, has been an honored tamada for 20 years. He says he spends nearly every weekend offering he unique service, whether the occasion is joyful or sad. The toast master enriches toasts with his flowery speech. "I don't propose many toasts. During weddings I propose at most 5-6 toasts. But I can tell 100 toasts with suitable quatrains," says Muradyan. Candidate of historical sciences Armine Stepanyan says that the Armenian word for toast ('kenats') means 'to somebody's life'. The initial meaning summarizes the idea of 'sacrifice to the King'. A toast is the best way to wish somebody a long life, health and eternity. Toasts are proposed standing. 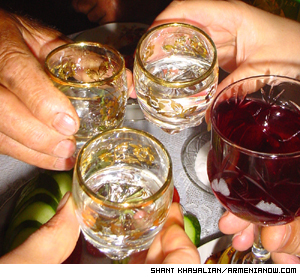 According to Armenian tradition, during all celebrations people drink to their mothers. Another tradition is to propose the first toast to welcome somebody. If it is a wedding celebration, the first toast is to welcome the father and mother-in-law. Gayane Gevorgyan, a 52-year old pedagogue, says, "When paying a visit to somebody, first you should drink to the host. The second toast can be proposed to his hearth and relatives." According to Muradyan, people today are tired of much talking and listening to admonitions. "If previously during weddings an aged person used to drink to newlyweds, telling them his entire past and preaching to them, today it is different." Muradyan mentions that the toast master should choose the right moment to take the lead in the feast, of course taking into consideration what kind of people surround him. As a popular Armenian saying tells, "As the feasts goes on, the sweeter toasts become." Usually men drink vodka, while women prefer wine. "When my glass is being filled, I usually ask to fill it half full, so that I can fill it up with my sweet speech," says Muradyan. "Many people say that 'you should leave some place for lips'. But shouldn't we fill it up with wishes?" He mentions that alcohol beverages are usually bitter, but when you fill your glass with sweet words, you get so excited that what you drink seems sweet. While proposing toasts, people usually fix their eyes on the glass. The glass gives some internal power to the toast master to express thoughts. People also get excited with the clink of their glasses that finalizes a toast, and after that, they drink. After drinking it is customary to say "anush", meaning, roughly, "to your enjoyment". On sad occasions, according to Armenian tradition, glasses are placed upside down. While drinking to the deceased, people touch glasses so that there is no clink. But Muradyan says that this tradition is gradually being left behind. Today it is preserved only if the deceased was young. However, it was different in old Armenia. It was not permitted to drink to the deceased on the funeral day, as the soul was still on the earth. Stepanyan explains, "Only seven or 40 days later it was allowed to drink to the deceased. It was thought that his or her soul was already in the sky. They drank to his memory and the immortality of the soul." During a baptism ceremony a toast master has no right to propose any toast before a clergyman blesses the table, congratulates the godchild and godfather and gives the tamada permission to speak. According to Muradyan, a tamada should be patient, compliant and polite. He should be able to attract any person quickly. "My biggest secret is in being patient," Muradyan says. "If I don't bear and forbear, I can't be in my position. I don't drink at all, I have my special Jermuk. I always take with me special bells that I use when I feel that the noise increases and people don't hear each other."